I thought we had tectonic plates last year! Perhaps Shark and the editors had forgotten about Phi’s tricky puzzle. Unlikely, so I guessed it had nothing to do with the way our planet is constantly being reformed. So what did Shark have in strore for us with his debut Listener. He has had a fair smattering of Inquisitors, EVs and Magpies. I have done a few of these, and have certainly enjoyed them. 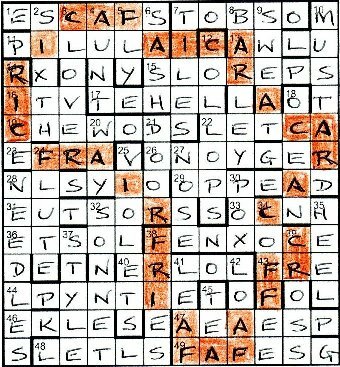 With the across clues here, entries had to be jumbled before entry, which is what the wordplay led to. My initial reaction was that this would make it fairly easy, but a lot would depend on how tricky the clues were. Every down entry could be prefixed with an adjective, and they all had something in common, except one. That one would determine the highlighting that we were to make in the finished grid. Starting on the acrosses as usual, 15ac Hammer almost hit salesmen (7), and the wordplay unequivocally gave SLOSREP. This was basically because I misread it as ‘salesman’ and had SLOS[H] + REP as the wordplay, instead of SLO[G] + REPS. Luckily the mistake came to light a mere hour and a half later! This also helps to explain why, for me, the grid was filled pretty much from the bottom upwards. I was highly impressed with the clues which, for the most part, had nice surface readings. My favourite was probably See criminal lie to son to get flowers (7) leading to VIOLETS (V + LIETO* + S). That’s just my sense of humour, I’m afraid. After about 2½ hours, the grid was complete, but there seemed to be no initial connection between all the down entries. What could MUSTARD and NEEDLES have in common? COLLOPS at 12dn looked like the way in, but Chambers only gives Collop Monday and minced collops. After a few minutes, SASH, DOOR and FRIES in column 6 came to the rescue. All those could be prefixed by French, as could HEEL, LOAF and POX (!) elsewhere in the grid. Given the title, I looked up other European countries in Chambers, and felt suitably smug as all the other associations came to light. I think the one that I liked the most, since I’d not come across it before, was German Ocean – their name for the North Sea It made me feel a little less guilty about calling La Manche the English Channel! After a good deal of thumbing through Chambers for European countries, I was left with the odd one out … VIOLETS, which could only be prefixed by AFRICAN. Now I’m sure that if I’d constructed this puzzle, I would have just asked solvers to write it in a space under the grid captioned Odd Man Out and left it at that. But not Shark. He positioned down entries such that after highlighting all the letters of AFRICA in the grid, we had a lovely outline of the continent. Did this self-imposed constraint make the puzzle ten times more difficult to construct? Perhaps Shark will tell us. This entry was posted on 20 April 2012 at 4:00 pm	and is filed under Solving Blogs. You can follow any responses to this entry through the RSS 2.0 feed. You can leave a response, or trackback from your own site.